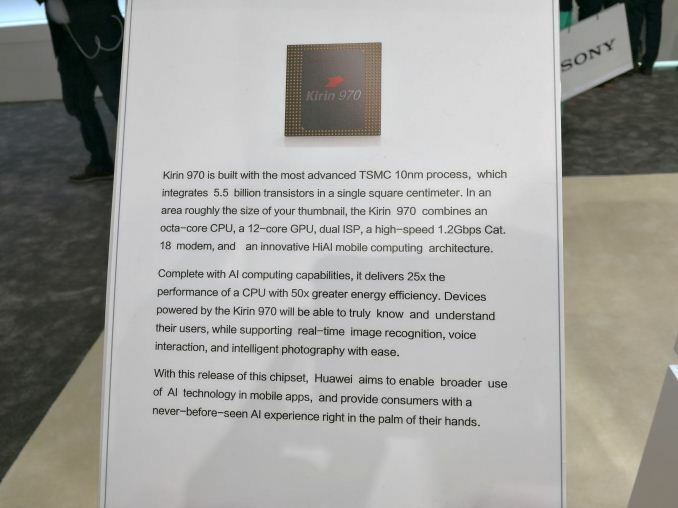 The headline that Huawei seems to want to promote is the addition of dedicated neural network silicon inside the Kirin 970, dubbed the Neural Processing Unit (NPU). The sticker performance of the NPU is rated at 1.92 TFLOPs of FP16, which for reference, is about 3x what the Kirin 960's GPU alone can do on paper (~0.6 TFLOPs FP16). Or to put this in practical terms, Huawei says that the NPU is capable of discerning 2005 images per minute from internal testing, compared to 97 images per minute without the NPU – and presumably on the CPU – using the Kirin Thundersoft software (likely a future brand name). Obviously, depending on the implementation and power use, I would expect Huawei to try and leverage the NPU as much as possible in upcoming designs. Other details for the Kirin 970 show improvements over the Kirin 960. First is the movement to TSMC’s 10nm process, from 16FF+. 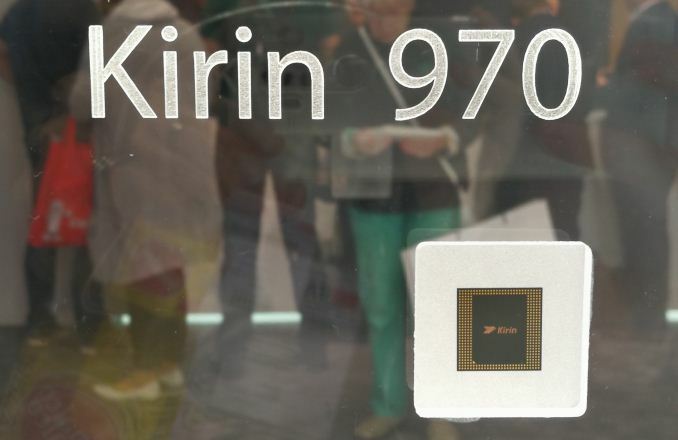 The Kirin 960 launched a few months before the 10nm ramp up for other high-end smartphone SoCs hit the shelves, so Huawei is matching their competitors here. 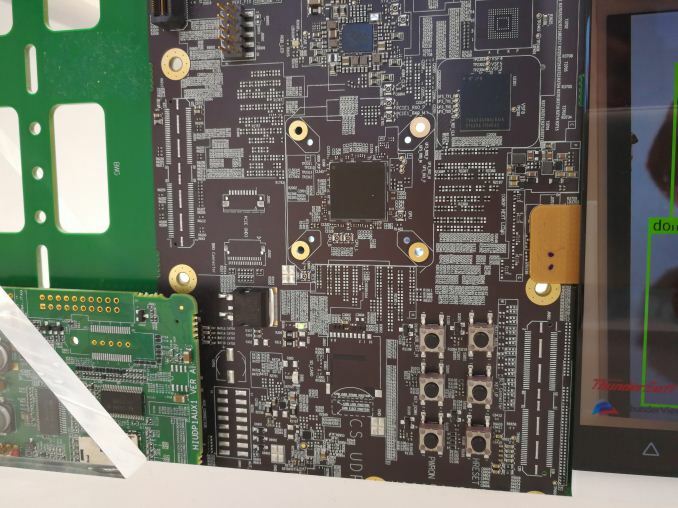 The core configuration is the same as the 960, with four ARM Cortex A73 cores and four ARM Cortex A53 cores, this time clocked at 2.4 GHz and 1.8 GHz respectively. The integrated graphics is the newest Mali G72, announced alongside the A75/A55 processors earlier this year, which will be in an MP12 configuration. Frequency was not listed. Other sticker features include dual ISP for motion detection and low light enhancement, support for HDR10 with 4K60 decoding, 4K30 encoding, and an LTE Category 18 modem, which Huawei states is good for 1.2 Gbps download. I’d be under the assumption that this is 4x carrier aggregation with 128-QAM. 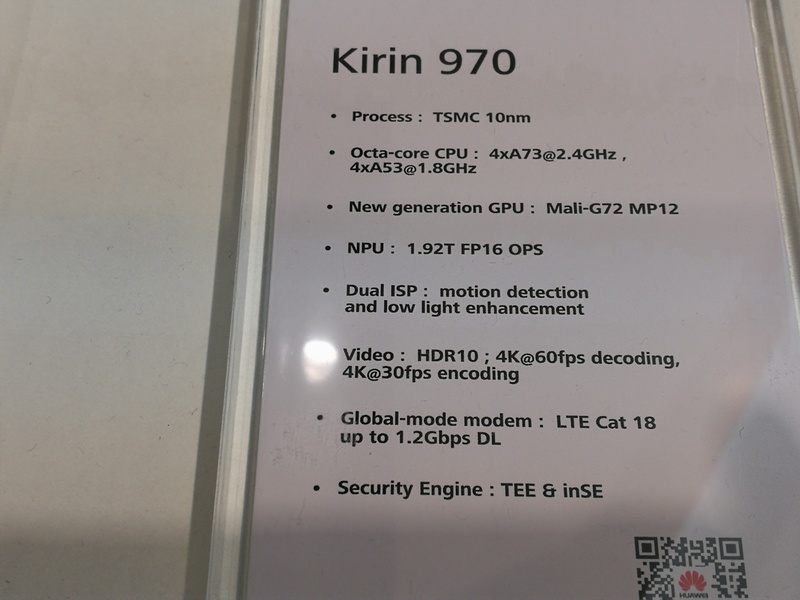 The Kirin 970 will also ship with an embedded Security Engine, supporting TEE and inSE. Huawei’s final declarations on the NPU state that it is 25x the performance of a CPU with 50x the energy efficiency, and using a new HiAI (Hi-Silicon AI) nomenclature. Huawei’s CEO, Richard Yu, has a keynote later this week and we also have some meetings with Huawei. I’m going to probe for details. The only smartphones with Kirin 970 on the show floor were generic models hooked up to development boards. Any devices coming to market (such as a Mate 9) will be a few weeks away, given launches from previous years. That 1200Mbps LTE Cat18 is probably not from 4CA with DL-128QAM. More likely a max performance is achieved while doing 4CA with 2 of the carriers being 4x4MIMO(vs 2x2MIMO on other 2) using DL-256QAM. Or with 3CA and all carriers on 4x4MIMO with DL-256QAM. So data 12 streams total with either option. You won't see A75/A55 until next year. And there won't be any material difference since, by ARM's own admission, there won't be any efficiency gain going from A73 to A75.